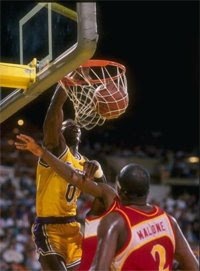 Check out this Orlando Woolridge dunk mix and remember to respect your elders kiddies. Props to maurixjames23 for the mix. Thankyou Orlando for your contribution to life. And most of all, thank God for Orlando Woolridge. He brought excitement to the game of basketball and with the L.A. Lakers. I never knew of his character personally, but he seemed like a friendly and good human being. He left us too soon. God bless his soul.